Recent figures show that only 4% of Melbourne’s 587,000 daily train rides are paid for using myki contactless smart cards, according to The Age. The statistics also show that many myki users are not tapping their cards correctly as they exit railway stations, or are sometimes not even able to at all due to faulty equipment. 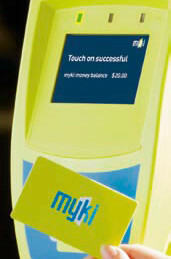 This means that those myki users not “touching off” correctly are stuck paying a higher bill than expected. According to The Age, about 30 myki customers phone the myki call center each day demanding an explanation for the faulty charges. Myki spokesman Stephen Moynihan says that commuters unable to touch off because of malfunctioning equipment will be reimbursed, and that the system will run better once myki is accepted on city trams and buses.